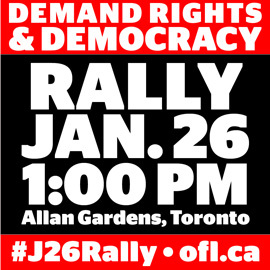 Join the Ontario Federation of Labour and over 90 community groups for a rally at 1:00 pm on Saturday, January 26 to bring our demands for democratic and economic rights directly to the Ontario Liberal Leadership Convention. The Ontario government has been shut down while workers’ rights are under threat and cuts to jobs and services are hurting every community. However, with an Ontario Liberal Leadership Race underway and a provincial election on the horizon, workers and community members are demanding new priorities for Ontario that respect labour, human and treaty rights and put people ahead of corporate profit. What: Rally and march to the Ontario Liberal Convention at Maple Leaf Gardens. Share this message with your networks and spread the word on Facebook and Twitter using the hashtag #J26Rally. Visit the OFL website for materials, event details and information on regional town hall meetings in your area. Contact your area labour council for information on local buses leaving for the rally in Toronto. Together, can stop the austerity agenda and the attack on rights. Let’s make Ontario fair for everyone!